A paul trap (quadrupole ion trap) is a type of ion trap that confines charged particles using DC and RF electric fields (not magnetic fields like in a Penning Trap). 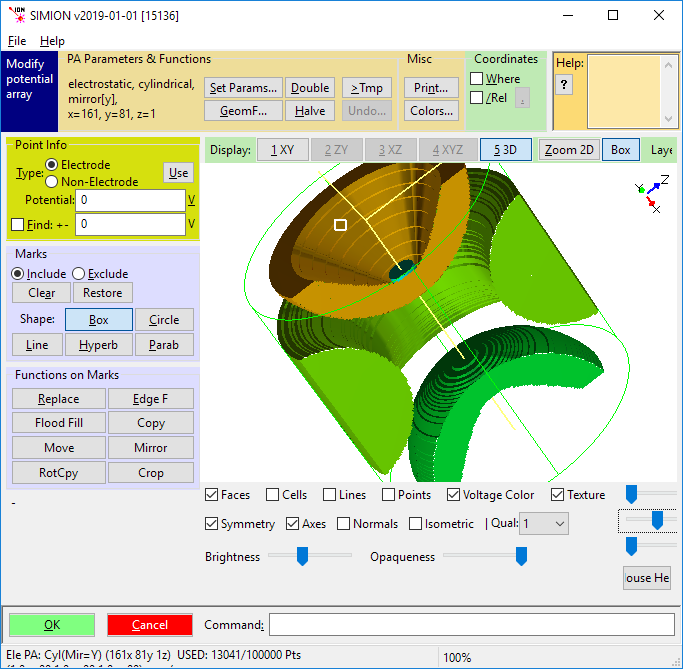 The examples\geometry folder in SIMION 8.0 contains GEM files for a few quadrupole and ion trap geometries. 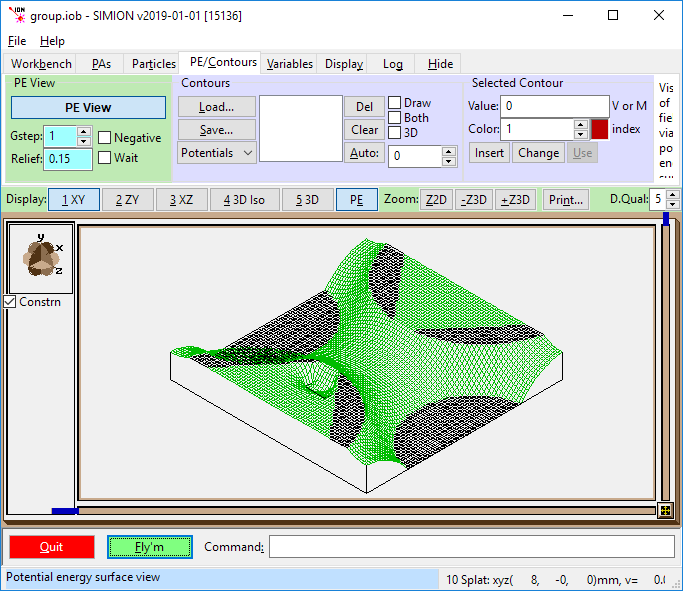 Session 6 “Quadrupole Principles” and Session 7 “Ion Trap Principles” in the Short ASMS Course (courses\short folder in the SIMION 8.0 program directory and also included in SIMION 7.0). About 50 pages of notes on linear ion trap simulations soon plan to be added to Virtual Device , covering analytical theory, SIMION tests, gas flow model, and trap capacity. As of Aug 2011 drafts are in progress. SIMION Modify geometry screen showing 3D quadrupole ion trap. 3D quadrupole ion trap, with adjustable variables. 3D quadrupole ion trap, potential energy view. 3D quadrupole ion trap, particle motion (showing heavy ions in largest shell). Papers on simulating Paul and multipole traps with SIMION would be too numerous to list here (hundreds or maybe thousands), but let’s add a few. If you have a paper, let us know to add it to this list. Search Google Scholar for more. Collision models in ion traps: See Ion-Gas Collisions. 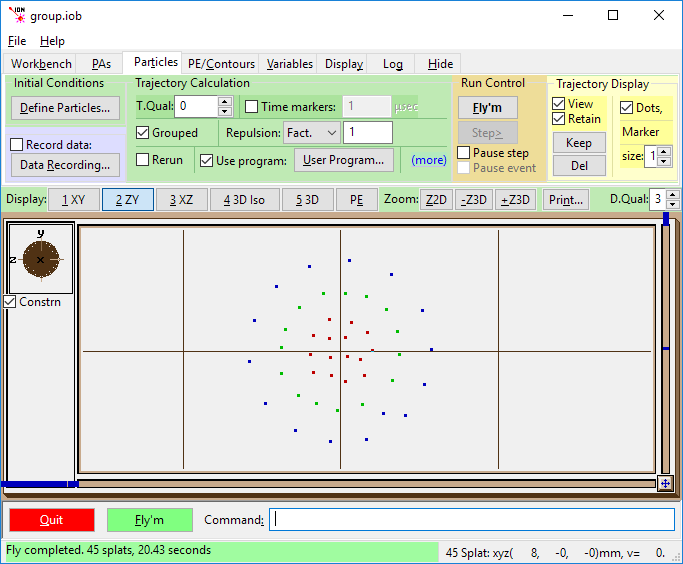 MassSpecPro.com: Linear ion traps tutorial with SIMION videos. Cylindrical Toroidal Ion Trap Mass Spectrometer Daniel Austin and Nick Taylor, Brigham Young University. http://hems-workshop.org/8thWS/Presentations/Austin.pdf background overview, pictures, and SIMION simulations. Workshop on Harsh-Environment Mass Spectromet, 8th (2011). Design, Development and Operation of Novel Ion Trap Geometries. Jose Rafael Castrejon Pita. PhD Thesis. The Blackett Laboratory, Imperial College. http://www.imperial.ac.uk/media/imperial-college/research-centres-and-groups/ion-trapping/public/Design-Development-and-Operation-of-Novel-Ion-Trap-Geometries.pdf - wire traps, some SIMION simulations. 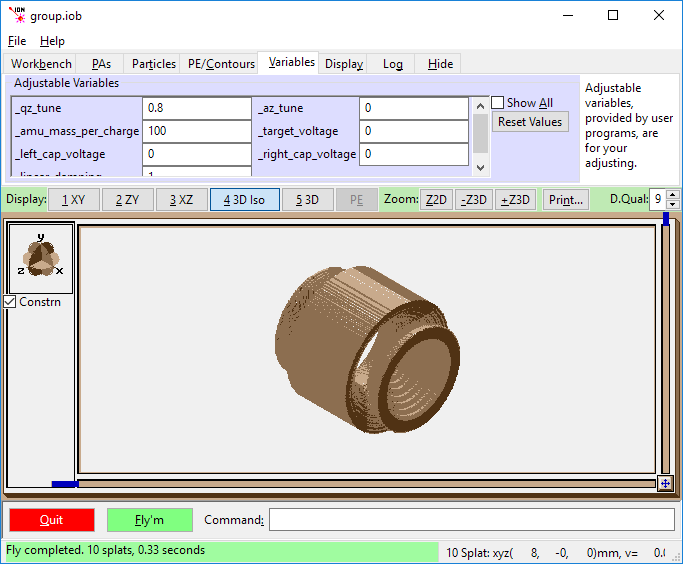 © Copyright 2004-2019 Scientific Instrument Services, Inc.